Day 12 – We made it! Madeira is a beautiful mountain island of Portugal. City of Funchal in foreground. Today marked the end of our Mariner of the Seas Trans-Atlantic ocean voyage to Europe. We sailed out of Galveston on April 21 and left the port of Nassau on April 24. 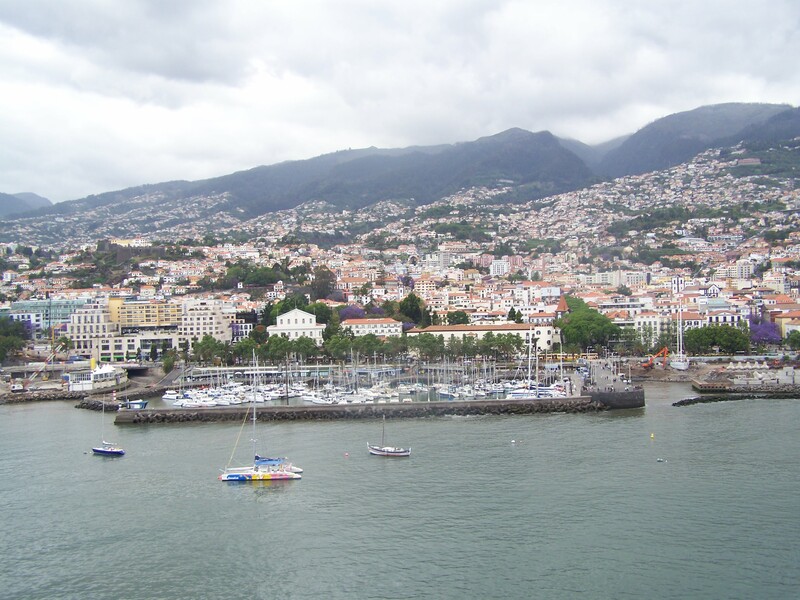 Eight nights and seven days later, we docked at Funchal, Madeira, before dawn – around 6-6:30 a.m. today. Madeira is part of an archipelago, which belongs to Portugal. It is spectacular, to say the least! Our only complaint of the day was an overcast sky! Otherwise, we were astonished by this little Portuguese Island! I will never forget the sight that sparkled in front of my eyes as we were approaching the dock in Funchal. It was as if I were viewing a Christmas village, as every part of the island was aglow with thousands of lights that were the homes and businesses on the hillsides and mountainsides of the island – I was simply amazed! As daylight approached, and as we paused at the first stop of our excursion, we could see the picturesque marina and the many terracotta-tiled roofs of all the homes and businesses. Madeira means “wooded island” in Portuguese and it lives up to that name. However, we found that the island’s small fishing villages, crops of bananas and grapes to be most surprising. Although there are no parcels of flat land anywhere in sight, the island is covered in thousands of patches of terraced gardens packed full of banana plants, grape vines or flowers, making this island an absolute wonderland! Our tour guide told us that Madeira earned a prestigious title – something like, “Floating gardens of the Atlantic.” A pleasant, constant temperature that stays within a variation of merely 10 degrees is said to be the reason why. We learned that the crops are grown on the island according to the altitude levels on the mountain. For example, different flowers are grown plentifully year around at different altitudes, depending on the species of plants. Near the coast, you find flowers and bananas in abundance. The next level is the vines – grapevines and floral vines. Higher up the mountain is European forest, and at the highest level only smaller shrubs. Not one inch of the island is idle. 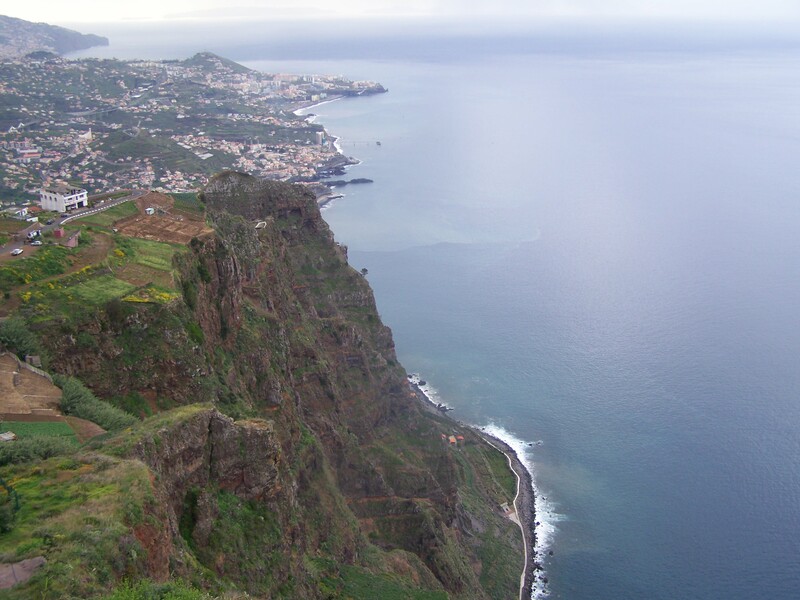 Madeira claims the highest coast in all of Europe at the cliffs of Miradouro Do Cabo Girao! The view is truly breathtaking! They welcome cruise ship passengers into their world for the sake of tourism. The people here learn to speak English as part of their curriculum, and at matriculation they are expected to know perfect Portuguese, speak English and their choice of French, German or Spanish. Wine is produced and exported here in abundance, along with bananas, leather, flowers and textiles. They are respectfully known for delicately embroidered goods and lace. We sampled a couple of local brands of wine, while enjoying cheese and fresh-baked bread. Yum! In a phrase – I fell in love with Madeira and the island’s beauty and resourcefulness! See you Saturday, after we have toured Gibraltar. Remember, we are cruising all the way to Singapore so come back often! You can also find my link at http://www.ourtribune.com. Highest coast in Europe is found at Madeira! Sounds wonderful! Hope u r taking lots of pictures.